There’s the tornado outlook from the SPC at 12z. The three of us were hanging out in the hotel planning the day and two schools of thought emerged: 1) Play the triple point and 2) play the dryline. The triple point was forecast to move into southwestern Kansas while the dryline extended south, ahead of a cold front through Texas. Looking back in hindsight, either one of these plays would have been a decent decision. You had the convergence and helicity at the triple point as well as backed winds along the dryline, so the convergence and helicity was there as well. For upper air support, a 100 kt jet streak was rounding the base of a trough and expected to nose into Oklahoma later that day. A pretty strong 80kt mid-level jet was expected to do the same. So, in hindsight, it seems that the ingredients were coming together for a potent outbreak south along the dryline where the upper and mid level jet maxima were juxtaposed with the high instability in front of the dryline. Here’s how it played out: as a group we decided on a compromise and headed south from Wichita to Caldwell, just north of the Oklahoma border. We arrived there at around 19z. Shortly thereafter the storms started to erupt along the dryline south of the US 412 corridor in Oklahoma. As we headed west on 60 to try and get in position is when the tornado warning went out on the Canton storm. At that time we were 55 miles away, as the crow flies. And such is how the day went. We spent most of the afternoon trying to catch up to tornado warned storms, the closest we got to a tornado was 50 miles from the Canton Lake EF-4. We ended up in Independence where we called it a chase, grabbed some dinner and Rob and James headed home and I headed for Missouri where the following day would be my redemption. So, lesson learned. If you have two schools of thought, do not compromise. In one way, or another, you must decide which way to go. 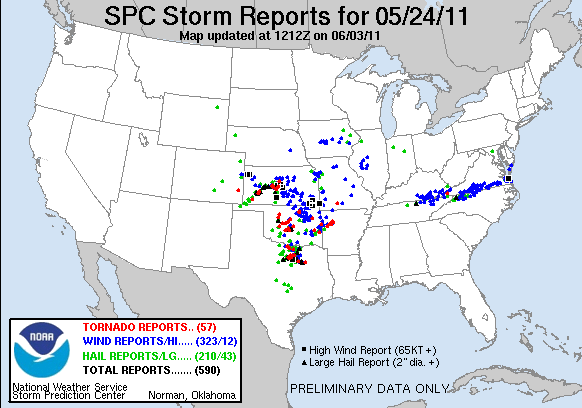 The compromise we made as a group put us between the cluster of tornado reports in Central Kansas and the cluster of tornado reports in West Central Oklahoma. The chase went so unfavorably that I did not take one picture or shoot one second of video. This was Rob and James last day of their mini vacation, so I felt for them having to make the drive back to Minneapolis after such a disheartening day. I still had 10 days left on my chase vacation, so I wasn’t as disappointed as they must have been, even though we had a great chase on the 21st and another good one on the 22nd.